Bookshelf speakers are meant to rest on a shelf, table or other elevated surface – anywhere but the floor. They’re specifically designed to maximize sound in small to medium-sized spaces. Like anything else, doing your homework before making a decision will definitely pay off. For instance, some are geared specifically for movie buffs, while others are tailored to take your music listening experience to the next level. When you’re ready to pull the trigger on bookshelf speakers, we’ve got you covered with the basics every consumer needs to know. Just because they're named "bookshelf speakers" does not mean they have to go on a bookshelf. Think outside the box and get creative where you place them. Before getting into the specifics of bookshelf speakers, it is important to understand the difference between bookshelf speakers and powered monitors. After all, they have a lot of similarities. You would certainly be forgiven if you took a glance at the R-14M bookshelf speakers and R-41PM powered speakers and assumed they were the same thing. Outside of minor aesthetic tweaks, the two sets of speakers look largely the same, are equal in size and even boast a similar acoustics package. The main difference between these bookshelf speakers and powered monitors is the latter has amplification built directly into the speaker. All of the functions and connections of an A/V receiver (AVR) are built right into the R-41PM, while passive bookshelf speakers like the R-14M require the use of a separate AVR. The powered monitors' built-in amplification and connections not only cut down on the number of additional components you'll need for setup, but also gives the manufacturer full control of the signal path. On the flip side, many customers may prefer the ability to use their existing AVR and to just upgrade the hardware separately down the road. You can purchase bookshelf speakers as stand-alone additions to your living room, or as part of a larger home theater system. If you’re serious about upping your audio game, there are tons of great home theater systems that incorporate bookshelf speakers. But if making that type of commitment isn’t in your budget, opting for a pair of high-quality bookshelf speakers can certainly add some bang to your music or movies. Don’t have much room to work with? 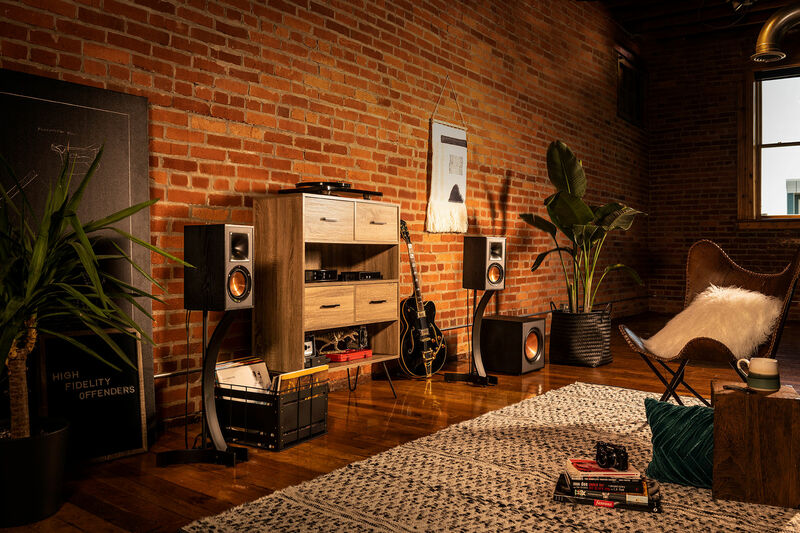 The R-41M bookshelf speakers offer the best of both worlds - they are designed for small living spaces. They come in a compact size that doesn’t sacrifice performance one bit. However, if you have a bit more space to work with, the R-51M bookshelf speakers deliver next level sound and bass unlike any other bookshelf speaker. Even still, when buying these kinds of speakers a la carte, it isn’t a bad idea to look for ones that will ultimately fit well into a larger home theater system. Keeping the big picture in mind will save you from having to buy another pair of speakers later down the road. You can take a stab at building your own system here - no commitment. If you aren’t exactly an audio junkie, all the technical jargon attached to bookshelf speakers might as well be in Greek. But you’d be doing yourself a favor to at least understand what the basic lingo means. Here’s what you actually need to know when shopping for bookshelf speakers. Hertz: The lower the number, the heavier the bass is going to be. Watts: Generally, the higher the number, the greater output you can expect. This is particularly relevant when it comes to matching your bookshelf speakers to an appropriate amplifier. Drivers: Basic bookshelf speakers have two – woofers (which generate bass) and tweeters (which produce high-frequency sounds). Buying a speaker set with a third mid-range driver will lend itself to better full-range sound. What good is a bookshelf speaker if it doesn’t have a shelf to sit on? The truth is that you’ll need a piece of furniture to place these speakers on. While an actual bookshelf is certainly an option, many prefer to use a speaker stand. These are great because their height is designed to bring the speakers to ear level when the listener is seated. (Keeping bookshelf speakers at ear level is crucial when it comes to achieving tonal balance. Otherwise, the sound will be out of whack.) If you don’t really have the space for freestanding speaker stands, or if you have young kids who run the risk of knocking over your new equipment, wall mounts will also do the trick. Another accessory to consider? Listeners who crave deeper bass may want to invest in a powered subwoofer. Whether you place the bookshelf speaker on an actual bookshelf, on speaker stands or on top of a media console, you need to properly place the speakers. The general rule is to put bookshelf speakers at 10 o'clock and 2 o'clock positions, angling them towards your preferred listening position. The tweeters should be at ear-level for optimal performance. If you do add the optional subwoofer to complement your bookshelf speakers, check out our guide on how to place a subwoofer. Or, simply start shopping for bookshelf speakers now. Do you have any other questions regarding bookshelf speakers? Feel free to post a comment below!